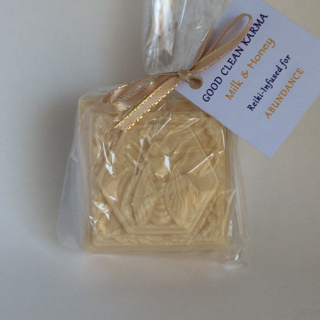 Good Clean Karma soaps make every bath an uplifting experience - they smell wonderful, cleanse thoroughly, and rinse away clear! 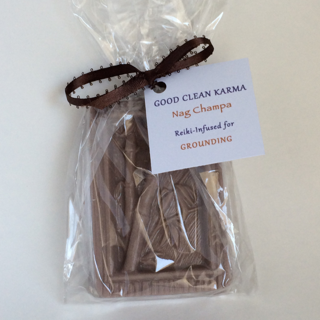 Good Clean Karma is my hand-made Reiki-infused soap line. 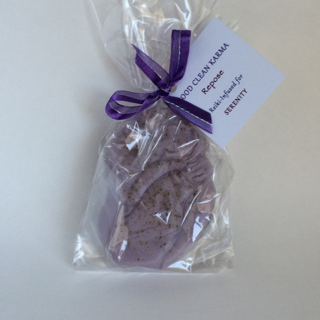 Sourced from the finest ingredients I can find — vegetable glycerin; essential oils, creams, and butters; healthy additives like oatmeal, milk solids, camomile, and sea kelp — and Reiki-infused with special intention at every step in the process. Small batch production means every bar is unique, formed in beautiful molds with themes of awareness, nature, and beauty, and individually packaged with hand-tied bows and descriptive tags. Place your order by email right now! Include your name, shipping address, the number of bars of each type you would like, and your PayPal billing address (or call me to provide a credit card number.) Shipments are sent within 24 hours of payment. Shipped by Priority Mail, a 6-bar order fits in the smallest box and costs $7.15. Larger orders ship for $13.60. 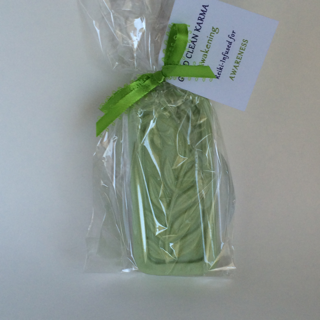 Wholesale pricing and custom orders also available for 30+ bars. Please contact me for details.